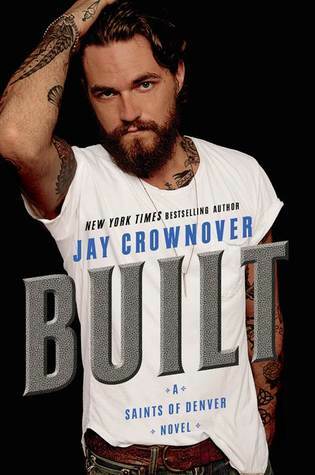 Jay Crownover dazzles with Built, the first full length novel in her Marked Men spin-off series, Saints of Denver! Sayer Cole has been conditioned never to show any emotion. The only time she has gone against that teaching is when she packed up her whole life to move to Denver to find her half-brother Rowdy. When she meets Zeb Fuller though, she can't help but feel. He brings out every emotion she was taught to ignore, and that scares her. Because what if Sayer can never return Zeb's feelings with the fire he shows, she can't stomach the thought of disappointing him. Zeb is someone who loves with his whole heart and will stop at nothing to protect those he loves, he's passionate and impulsive, but has had to pay for that impulsiveness with some hard time. Now he keeps his head down, works hard, but still loves harder. And when he first see's Sayer, he knows that together, they'd be all fire. The walls around her heart though are thick as steel and coated in ice. And just when Zeb thinks he has finally made a crack in them, a consequence from his past recklessness shows up, throwing those walls back up and upending his whole world once again. Built is a story of two unlikely hearts colliding. One, a wealthy attorney who is chilly and reserved, the other an ex-con Mr. Fix-it, determined and full of passion. We were first introduced to Sayer and Zeb in Rowdy, where we get bits and pieces of Sayer's frigid upbringing. I was definitely more then able to empathize with Sayer in this department, her father was a real piece of work and he's very lucky to no longer be alive to face Zeb. Just sayin. I have so much love for him and Sayer. These two were the epitome of opposites attract, and their contradictions worked beautifully. The story was a little slow moving at times, it was very much a one step forward, two steps back kind of thing. But it followed with the character's behaviorism's so I couldn't really fault it. Zeb and Sayer's passion was palpable in each scene together and I couldn't get enough of Zeb's growliness, and there was nothing icy about Sayer when she was between the sheets with our Mr. Fix-it. I loved seeing the Marked Men family throughout the story as well. It had that coming home feeling that I love reading in series. There was so many tender and heart-warming moments in the story, I found myself smiling a lot. ☺ Jay Crownover has penned another fabulous story with powerful emotions, strong characters, and a captivating plot. I am looking forward to the next book in the series, Charged.